The "silent drumset" presents different forms of muffling of drums and cymbals to play in an apartment without disturbing neighbors or to practice without damaging the ears. But nevertheless know that muting the vibrations of instruments gives a more flat sound (without dynamics, contrast) which can give the illusion of greater control and encourage to exaggerate the accents. So nothing can replace the practice on an "open" acoustic instrument, vibrating freely, which is for me more beautiful, more difficult (for regular identical strokes) and in any case more expressive. Firstly it should be noted that you can simply reduce the overall size of the drums to do it ("Jazzette" drums for jazz club (10, 12, and 13 or 14 inch toms, 18 or 16 inches for the bass drum). Elvin Jones is the originator of this type of drumset because it was obliged to carry it in a taxi from a club to another at his beginnings (it proves that there is no limit of the field of creative expression). 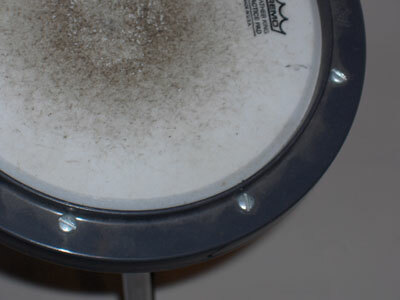 You can find felt mutes that stick or pressed under the skins, rubber mutes (or "mufflers" (photo)) to strike on them which fit over the entire surface of the drum head or part of the cymbal, thin plastic ring that are also putted on the skin (which just serve to reduce some resonance for a more "flat" playing) and finally foam plated thanks to a frame that is inserted between the drum hoop and the drum shell. Some drummers stick folded paper tissue on the skin or directly use rubber adhesive tapes. For the bass drum a pillow or a folded blanket is often used, which is pressed against the hitting ("batter") skin (or "head"). Also note that the coated skins resonate less than transparent and single skin less than double (because lower pitched because heavier and hence with more inertia). Finally, you can add rivets or chains ("rattler") on cymbals, to reduce their power and ability to "crash" (a coin attached to a tape can also be used). 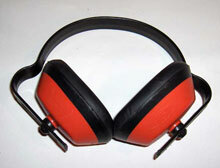 If your goal is just to protect your ears, a worker earmuff (photo) with shell (or "cup") and foam rubber band around the ears (more comfortable, hygienic and reduces less the overtones balance) or ear plugs can do the trick. A good studio headphone (with cup, shell again) fulfill the same office with addition of an audio feedback if your drumset is equiped with microphones (ideal). 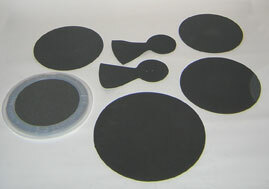 There are plastic cymbals (photo on top of page) and modern drum sets with rubber skin ("pads"). 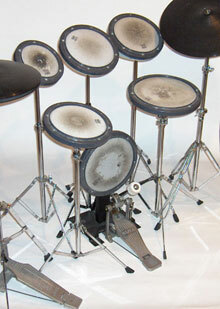 It is manufacture since 1980 rubber drumsets of this type with electronic amplified sensors, emitting synthetic sounds through speakers or headphones (commonly called "electronic drum set"). Although some of these drumsets retransmit the strength of the strokes ("dynamics") and even sometimes strokes on rim, they are far from equal the richness of tone and sensitivity of a real acoustic drum (on the touch and sound aspect) and I think it's just physically impossible (percussion induced a sound transmission mode too much complex, which can avoid the perception of a neophyte but certainly not that of an experienced musician or music lover (see my lesson " How to tension your drum skins" for a beginning of acoustic scientific approach of acoustic drums)). That is why I would recommend them only for a parsimonious workout (to not pick up bad habits of playing), to protect your ears or those of your neighbors (playing in appartment). 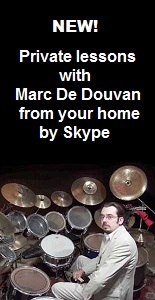 The other disadvantage of electronic drums is that they are very expensive (due to technology) and it is a temptation to avoid the buying of a real acoustic drumset (at the same price in the mid-range) even on stage (excesses made and defended by some "great drummers" only in an unworthily commercial purpose in my opinion). Note also that the rubber is more harmful to the cartilage and tendons than normal skin. Moreover, there are now also electronic drums with mesh skins. It is also possible to fasten sensors ("triggers") on acoustic instruments (drums, hoops, cymbals, etc.) to trigger different layered sounds (this is what Akira Jimbo use). These sounds can be programmed in advance and controlled by hitting on a pad. It is also possible to create a loop of sounds (with a cycle: Example 3 strokes: one different sound for the first, the second and third stroke, for the fourth you come back to the first sound, etc.). This is the system used a lot by Akira Jimbo, who plays solo, to imitate melodic instruments (bass, piano, etc). Finally, you can trigger entire drum loops with a single stroke (but then can we really speak of playing, from the moment of the rhythmic composition is fully supported by the machine?). Some drummers play with a machine imitating a drumset playing ("programmable drum machine"). For my part, I do not like this system because it "blurs" the drummer playing (who does what?) and forces to play without change of tempo (this variation was however always been part of musical expression). There are plasticine pads that become very elastic if it is strikes strongly or with foam pressed under a skin and a plastic hoop (brand Remo (photo), my favorite model that I have used for over 5 years, when I lived in an apartment by constituing an entire set of 6, 8 and 10" (photo on top of page)). 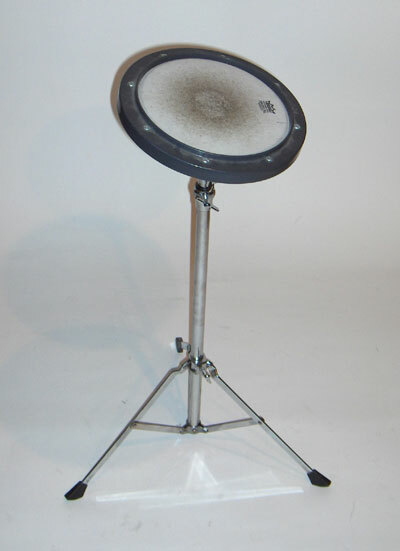 It is sold models of the latter type in kit mounted on a central stand (8 inches in diameter per drum in general, 4 horizontal drums, one vertical with bar to fix a bass drum pedal). Otherwise, the pads are usually fixable thanks to a single central nut to special stands ended by a screw. You can practice anywhere with this kind of pad (hence the expression "practice pad") by simply placing it on a chair or table without disturbing the neighbors too (there are also in rubber). For the less fortunate, know that with a good pair of snare sticks (drum sticks), you can play on almost any surface (cardboard, wood, stone, metal, etc.). Some Afro-Americans have invented a style of drumming that consists to play on a set of returned plastic buckets with different sizes. This street art, which can be played with great virtuosity (based on the rudiments of military drum), has the disadvantage of excluding the footplay but some lift a bucket with a feet to imitate bass drum by shocking it against the ground. Finally, for practicing to play brushes, know that a good book on your lap (as Daniel Humair does) , a table, a cardboard box (as Steve Gadd does) or a coated skin alone can be enough.